"A multifaceted novel of satire and parody, with a solid core of gravitas; Washington DC is a central character—a living, breathing complex organism that fascinates us with its exterior splendor, astounds us with its great powers, and nauseates us with its foul excretions. Highly recommended!" The Columbia Review. “Henry Tuckahoe’s War With Washington” by Lawrence Melton is a novel of satire and parody, with a solid core of gravitas befitting its setting: Washington DC. It is a realistic and cutting portrayal of life (and death) in the capital of the richest nation on earth, yet rooted in events and grudges originating in an era when Native Americans ruled the land—and suffered an unjust demise. The author is especially capable in bringing Washington DC into the story as a central character—a living, breathing complex organism that fascinates us with its exterior splendor, astounds us with its great powers, and nauseates us with its foul excretions. Indeed, the novel delivers a most admirable yet damning depiction, perfectly contrasting Washington’s magnificent monuments and massive, stately government buildings with its odorous political cesspool, big-money influence peddling, and the greedy immorality of self-righteous officeholders. 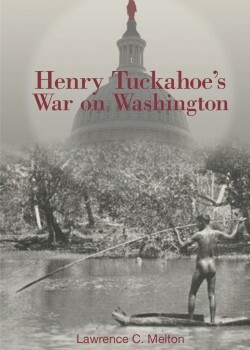 In summary, “Henry Tuckahoe’s War With Washington” is a multifaceted novel that reads almost like a great non-fiction exposé, transporting the reader into a world that feels utterly realistic. The storyline is lively and full of surprises, the humor is sharp and clever, and the characters are lifelike and tangible, as familiar as living men and women. For readers interested a suspenseful story of politics, money, and a dark past that comes back for a just revenge, this novel is highly recommended!